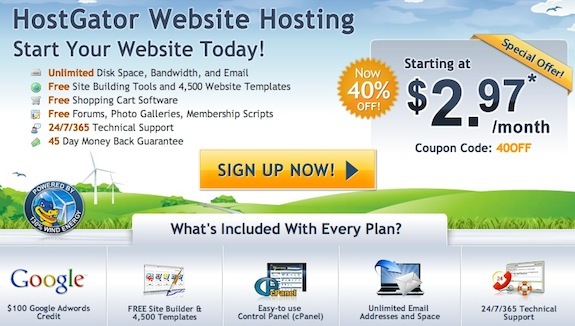 40% Off On HostGator Web Hosting PLUS Free WordPress Installation! Great News! Starting today you will get 40% discount on Hostgator hosting packages on both Linux and Windows Hosting. Their rates are really affordable and until this 31st August 2012 you can start a new blog for as low as $2.97 a month! This promotion will last until 11:59 PM CST Friday, August 31st 2012 and after this date you will have to pay the regular price. Benefits You Get If You Order Right Now!